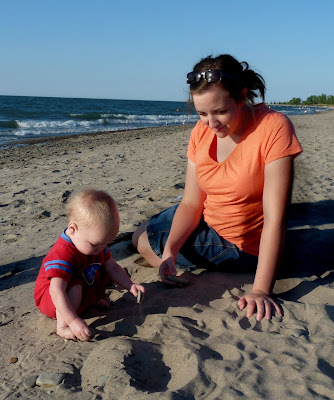 We took Luke to the beach nearby where we live--Lake Erie is only a few minutes away from our house. He was a bit unsure what to do with the sand, but it was hard to keep him away from the water! I would have just let him go in but it was really windy and a bit too chilly to get too wet. Oh and have you seen Morton Salt in the grocery store? It comes from here. There's a salt mine in this lake and a factory right by the beach entrance. Pointing to the seagulls--there were hundreds! And because there aren't enough pictures of me these days--here's me playing with Luke in the sand. Hey, it's funny enough just watching him walk across the room. Walking on sand? Comedy gold.